One thing that I LOVE to use my Instant Pot for is making baked potatoes. I can cook them in 10 minutes and eat them up immediately or use them for another recipe, like potato salad. It’s just a convenient way to cook potatoes. 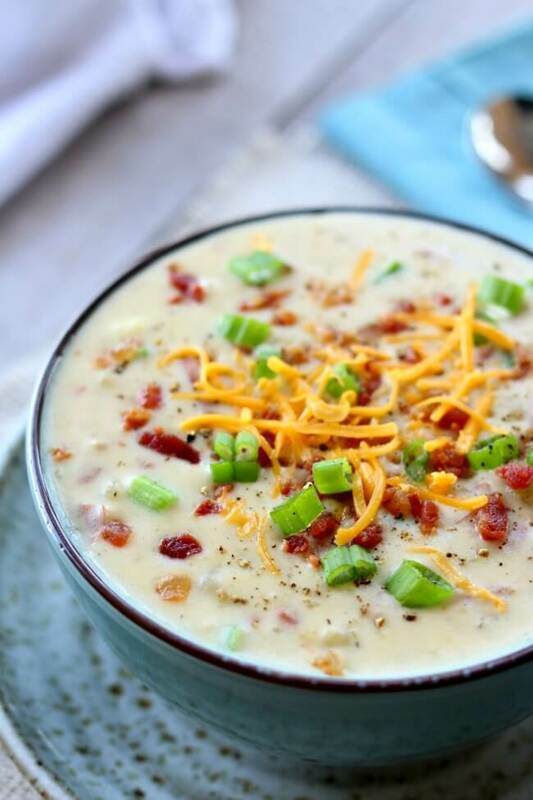 This recipe for instant pot loaded baked potato soup starts with cooking potatoes. I used red potatoes but you could also use yellow potatoes or Russet potatoes. I chose not to peel my potatoes because I like the skins of red potatoes and the texture that they add to the soup. If you’re using Russet potatoes you may want to peel the potatoes before cooking them in the pressure cooker. After the potatoes were cooked I took them out of the pressure cooker and then made a roux with flour and butter on the saute setting. This is just done by melting the butter and then whisking one tablespoon of flour at a time into the butter until you get a creamy, lump-free consistency. This helps thicken the soup. After I made the roux I added in milk (I used 1% milk). I used the saute setting to heat the milk until it was bubbling and thickened up, thanks to the roux. At this point I added in the potatoes. I chose to mash my potatoes on a cutting board before adding them back in. Now they weren’t totally mashed. There were some parts that were mashed and some parts that were chunky. Again, I like the different textures in my soup. You could mash them completely for less texture or you could even cut them into cubes for more pronounced bites of potato. Lastly I stirred in some sour cream, grated cheddar, green onions, and real bacon bits to make it the real deal. This is creamy and indulgent and frankly quite delicious. The recipe below makes about 5 servings but you can easily double this recipe with no problems. I don’t think this soup is a good one to freeze considering it’s dairy based and potato based…both items that don’t do well in the freezer. But you can keep this in the fridge for up to a week in an airtight container. 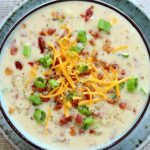 For Instant Pot Loaded Baked Potato Soup I used my 6 quart Instant Pot Duo 60 7 in 1*. I also own the 6 quart Instant Pot IP-LUX60 V3 Programmable Electric Pressure Cooker. * They are both great pressure cookers! The first one I mentioned has a yogurt making function but other than that they are fairly similar. The price difference between the two is about $20. 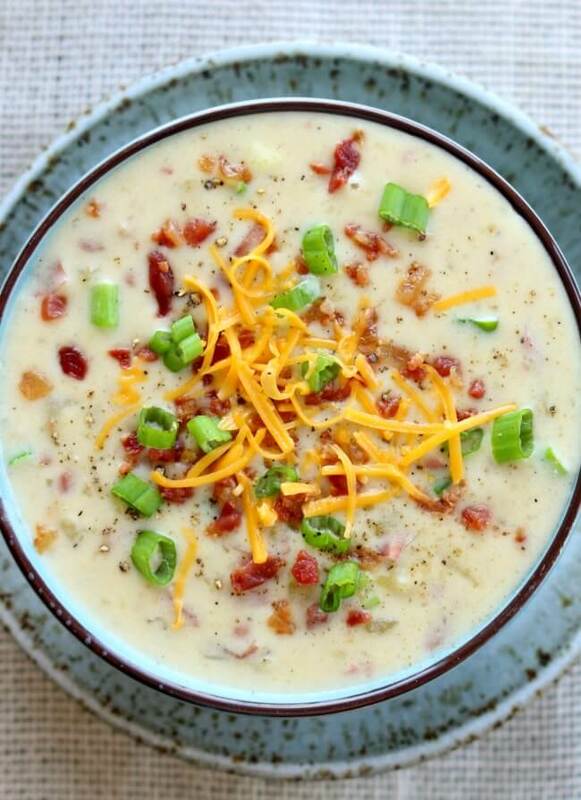 Everything you love about baked potatoes in soup form…cheese, bacon, sour cream, green onions and potatoes. 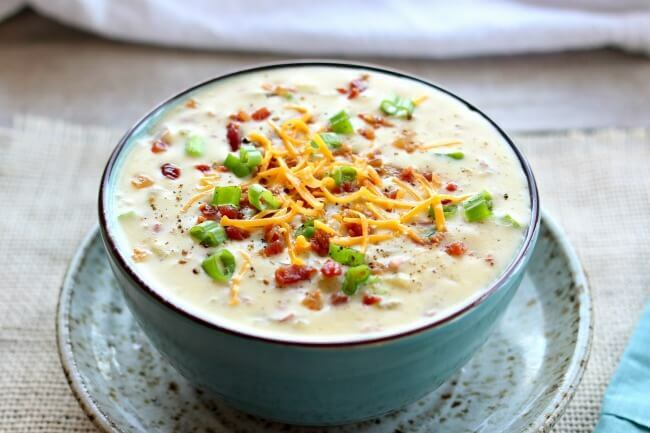 Basically a cheesy potato soup recipe that you can make in your electric pressure cooker. 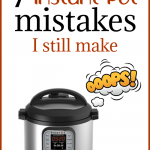 Cover the Instant Pot and lock the lid. Make sure valve is set to “sealing.” Set the pressure cook button (mine says manual) for 10 minutes on high pressure for red or yellow potatoes and 20 minutes for russets. When the timer beeps carefully move the valve to “venting” to let the pressure release. When you can, remove the lid. This soup can be doubled. Oh my gosh this was so easy to make. I am not a cook and nor do I know how to. 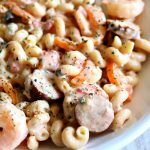 I am new to the Instant Pot and have been trying recipes. Today was a cold day, & I wasn’t feeling well so I decided to try this recipe. It hit the spot, and I truly felt better afterwards . I added a little garlic powder because of the comments I read above. Delicious! Delicious! I added in 1/2 tsp garlic powder with the salt and pepper! Omgoodness this was so easy and delicious ! I will be making this tomorrow in my IP. Can this be doubled and still fit in a 6 quart Instant Pot or is it too much? It may be too much to double in a 6 quart. But you could 1 1/2 times the recipe. Delish and easy to make!! If I don’t have bullion, can I sub in 1 cup of broth? If so, would I just adjust the milk down for the same consistency? Delicious and easy. Will definitely make again. I just made this for lunch, delicious! Please sign me up for your free recipes. What can I use instead of the Better than bouillon? I have company coming over that’s Vegan. I have substitutions for the other meat items. Are they vegetarian or vegan? Because this is not a great vegan recipe since it has butter, milk, sour cream, cheddar and bacon in it. If they are vegetarian then I would just leave out the bouillon and season to taste with salt and pepper. 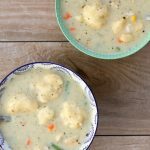 As a vegan, this is actually the best potato soup recipe I’ve found to be able to convert to vegan. I used unsweetened cashew milk and earth balance vegan butter to cover the milk and butter, the VEGAN version of better than bouillon which is their NO chicken base but it tastes just like chicken, and I added a whole stock of chopped green onions. No need to sub cheese – you can’t make it taste anywhere like the real thing so I don’t bother. But you CAN sub bac-o-bits from McCormick as they are also vegan. Is this super healthy? No. But it’s an AMAZING treat for those of us who miss a creamy potato soup. Thank you for creating such a delicious recipe!!! Wow! Kudos to you to figure this all out! The soup was delicious! However I had to change a couple of ingredients, but it still was very good. I used chicken sausages with red peppers instead of bacon bits. Also I didn’t have sour cream so I substituted with plain yogurt. It turned out excellent! Holy smokes this was so good and so easy! Will definitely be making again! Quick and easy. Great for a cold night! I too needed to cook my potatoes for maybe a minute more – though I admit I like chunky potato soup . Found it could have used a tad bit more salt and pepper (easy to fix in my own bowl) – so will probably try the suggestion found here to add some Slap Ya Mama next time! Also really liked the Better Than Bouillon – never used it before and found it had a nice flavor. Seems creamier than regular bouillon granules or cubes. Will add that to my list of staples now! Thanks! Best thick potato soup I’ve ever ate or made! This was sooooo good. Not the super low cal dinner, but the taste of butter, bacon, milk and potatoes is worth the calories. 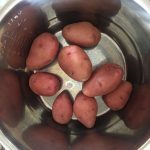 This was my first recipe with my Instant Pot….although I cheated a bit by boiling my potatoes the day before….I was scared of the pressure cooker! I’ll get there!! Thanks for sharing this yummy recipe. Glad you liked it Isabelle!! So good! Made it for my recouperating sister in law surely put a smile on her face ! Everyone loved it , will definitely be making it again. You are a nice sister Kathy! So good!!!!! Thank you for sharing! Really tasty. Probably the best potato soup I’ve had. Full bellies over here. Took about thirty minutes. so glad you liked it Travis! I made this tonight and it was very good! I used closer to 2#’s of potatoes. I didn’t have chicken bouillon base so substituted chicken broth. Also added one cup of half n half for a thicker creamer soup. Along with the two cups of milk it made a thick soup. I ended up sing a bit more chicken broth soup was quite thick. Also omitted the sour cream and cooked two slices of bacon instead of the bacon bits. Quick, delicious soup! This was amazing. I would definitely make it again, and will probably serve it to company. The only change I made was to replace 8 oz. of milk with 8 oz. chicken bone broth to increase the protein and decrease the milk for my slightly lactose intolerant husband. Also, to save time, I did everything else in a pan on the stove while the potatoes were cooking and then poured the mixture over the potatoes after smashing them. I made this first for my family and we loved it so much that I made it for a potluck with my coworkers and several people asked for the recipe! It was a huge hit! Thank you! I would like to make this for a football tailgate. If I make it in the Instant pot can I keep it warm in my crock pot? What is the best way to keep it warm? I would just keep it in the Instant Pot and put it on the keep warm function. That would be easiest! I made this tonight and had 2 small hiccups. First, I should have cooked the potatoes for a few more minutes. I thought they were done after 10, but some were a little undercooked. Since I prepared the recipe early, I mashed the done potatoes and diced the undercooked ones. I put it on a high slow cook for 2 hours to finish. The other issue I had was because I doubled the recipe, it was 8 cups of cold milk at once. It took forever to boil and I didn’t stir enough so I got the burn error. Next time I will bring the milk to room temp before adding. All in all great recipe. The mistakes were all mine. Thanks for sharing. This will help others not make the same mistakes. Excellent. Wouldn’t call it low calorie or low fat but I was looking for a recipe that did not call for cream or half and half. Being a Louisiana girl, I couldn’t help myself. I used Slap Ya Mama for seasoning. Not for everyone but if you want to kick it up a notch, works like a charm. For Jesse use tapioca flour it blends very easily is used a lot in pies as a thickening agent plus gives the pies there shiny appearance. Get it from a store that handles bulk foods. It cost me $1.25 per pound. Nice! I like this idea! 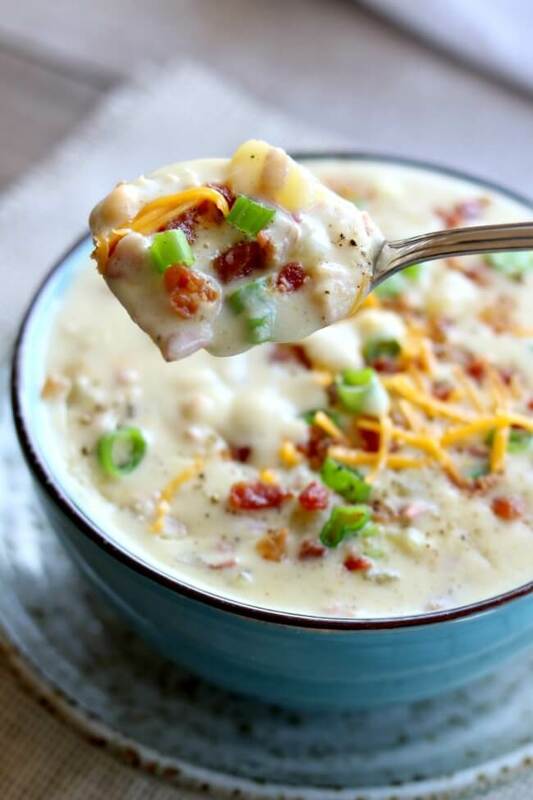 I love baked potato soup and so badly did I want to make this, but I got tripped up on the roux part. I’ve never made one before. I tried 4 times and each time, the flour just became a dough/solid. Am I being impatient? Wrong butter? Is my Instant Pot not on the right saute setting? I waited until the butter melted and put in 1 tablespoon, but I just could not get the roux into a more liquid consistency. I always wound up with solid clumps. Any tips? I’m determined to make this. So I would stir in 1 Tbsp of milk at a time with the flour. That should help loosen up the consistency. What can I substitute the Better than Bullion with? Do you have another type of bouillon that you could use? I made this today and it was very good! I made it exactly by the recipe, but then added a little onion and garlic powder and a pinch of red pepper for a little more flavor. It was so weird — I had exactly 1.5 lbs red potatoes, 3 green onions, 1/2 cup sour cream, 1/2 stick butter, a tiny bit over a tsp of Better than Bouillion left — it was like it was meant to be. haha! 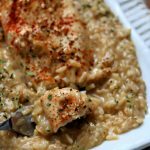 I will definitely add this to my Instant Pot recipe file! I will mash my potatoes a little more but that recipe was awesome. Loved it will be doing that again..
Sooo delicious!! My favorite place to get loaded potato soup is at Charleston’s. This taste just like it!! Is that a restaurant? I’ve never been there before. I’m glad you liked it! I found this comparable recipe on Genius Kitchen. Loved it. I cooked the potatoes with 1 cup of chicken broth instead of water. I didn’t have any green onions so added chopped onions to the broth while cooking the potatoes. Used the broth along with milk to make the 4 cups. Only other change was plain Greek yogurt instead of sour cream. Will definitely make again. Thanks. I got my mini Instant pot today. I did the initial test and hard boiled some eggs first. Then i tried your recipe!!! It was AWESOME!! I would omit the salt next time, as i don’t usually cook with it. I added some garlic powder, dill, paprika and nutmeg just for fun. This was a really delicious soup and i will make it again for sure. I shared with friends too. Thanks so much! I made this for super bowl Sunday and it was a big hit!! Thank you for sharing it with everyone! It was awesome! I’m not familiar with “Better Than Boullion.” Can I use one chicken boullion cube? Same thing? Different? You could. Sometimes the bouillon cubes are super salty. So maybe leave out any other salt until the end and then salt to taste. This is the first IP recipe I have actually taken the time to comment on, and it is AMAZING!!! The only thing I did differently was use chicken broth instead of water when pressure cooking the potatoes and then re-using that broth as part of the 4 cups of milk. Even before I put the potatoes back in my IP, the “sauce” smelled and tasted incredible! This one is perfect for a workday evening, and it is absolutely a keeper! Thank you for saving what was a very hectic day with this recipe! I bet it would fit. Just don’t go over the max fill line indicated on your inner pot. It fit in my 3qt. Just fine! This is amazing!!!!!!!!!!!! So yummy! Thank you for the recipe and time it took to create it. I followed basically the exact recipe except I added a few things. I had left over corned beef and cabbage, potatoes and carrots from a previous meal. My wife and child are vegetarian so I diced and set aside the cornbeef for me to add to my soup separately , and then used my vita-mix to purée the remainder of the left over veggies along with about 1 cup of veggie broth (fairly thick consistency, about 3 cups of purée). I added this and some additional spices, garlic, paprika, chili powder and substituted the chicken bullion (didn’t have any) with like a Monterey chicken spice blend (all about 1/2-3/4 teaspoon), added a little sweet corn as well to the mix, thinned the consistency with a bit more veggie broth to a nice hearty chowder like thickness and served it with some nice bread.Delicious recipe with plenty of leftovers, great for a winter meal. Hello! 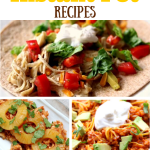 I am loving the idea of soooo many IP recipes I see here, and online (cookbooks, FB, everywhere). My problem is the I do not own an IP, but rather the Power Cooker Plus. How can I convert the recipes, when the ‘buttons’ are not the same? Flustered, for sure. I am not totally familiar with your pressure cooker. Is it the Power Pressure Cooker XL? I’ll try my best to answer your question. 1. Turn your instant pot to the saute setting. Add in the ground turkey and break it up with a wooden spoon. Brown it for a couple minutes and then add in the onions and garlic and saute until the onions are translucent. About 5 minutes. (If you’re using ground beef you may have to drain off grease). 1 (B). So the first thing I notice about the power pressure cooker xl is it doesn’t have a “saute” button. This does seem confusing. So what you’ll do is add the turkey, onions and garlic into the pot and push the button that says CHICKEN/MEAT. The inner pot will heat up and you can saute and brown your ingredients. 2. Cover and secure the lid. Make sure valve is set to “sealing.” Set the manual pressure cook button to 5 minutes on high pressure. 2 (B) You will then place the lid on the Power Cooker, lock the lid and switch the pressure release valve to closed.Press the WARM/CANCEL button. Press the SOUP/STEW button and then press the TIME/ADJUSTMENT button until you reach 5 minutes. 3. When the timer beeps let the pressure release naturally for 10 minutes (or more, if you have time). Move the valve to venting and when you can, open the pot. 3 (B). Once the timer reaches 0, the cooker will automatically switch to KEEP WARM. Let the pot sit for 10 minutes and then switch the pressure release valve to open. When the steam is completely released, remove the lid. After that point you can follow my original directions. I made this instant pot potato soup using the power pressure cooker xl. It DOES have a “saute” mode–it’s right in the center. I used the fish/vegatable setting to cook the potatoes. The thing to understand about this cooker is that most of the settings use the same pressure and temperature but the automatic times are different. 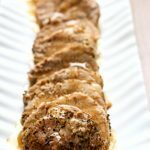 I loved this recipe!! So good! !